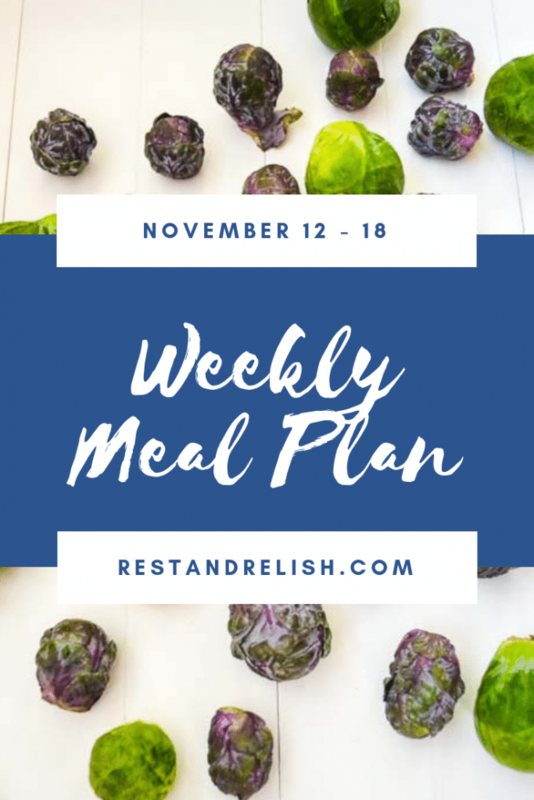 Rest & Relish Meal Plans include six healthy dinners with one night off for the cook! Mostly vegetarian/pescatarian meals with simple substitutions for vegan and gluten-free diets. Thanks for following along for another Rest & Relish Meal Plan post. This week the adults are going low-carb/no carb due to my husband’s marathon training schedule. We’ll add extra carbohydrates for the growing kiddos! Feel free to alter or switch days around in the meal plan to suit your own scheduling needs! Stuffed Acorn Squash with Steamed Broccoli. Stuffed Acorn Squash was on last week’s meal plan, but it did not happen due to a scheduling shift. This is a vegan recipe I’m creating to share with you soon! This will be a hearty Thanksgiving main for your vegetarian and vegan guests too. Taco Salad Bar. Create-your-own salad night! Salads like these are a great way to include lots of healthy protein and vegetables. We like black beans, Romaine lettuce, shredded red cabbage, colorful peppers, avocado, salsa and hot sauce. My son also likes a little shredded cheese and Greek yogurt for extra creaminess. If you are looking to add some more spice and flavor, try my Lime Vinaigrette. Sous Vide Salmon and Oven Roasted Brussels Sprouts. If you don’t own a Sous Vide precision cooker, you can roast the salmon with the Oven Roasted Brussels Sprouts. As I’ve mentioned, our son doesn’t eat seafood so I’ll likely serve him a piece of chicken or chicken sausage. Also, the kids have been asking me to make mashed potatoes, so they’ll have potatoes as well. Soup & Salad Night. This is a great time in the week to see what vegetables you can round up in the refrigerator before anything goes to waste. Once you have gathered your vegetables, follow me on Pinterest for Soup and Salad inspiration. Roasted Tomatoes with Shrimp and Feta. I found this Real Simple recipe on Pinterest a while back and think it will be perfect for a casual Friday supper. This dish would be great with a side of whole-grain or gluten-free pasta too. Serve with a green salad and enjoy! Cook’s night off. Leftovers or out to dinner. Charcuturie Board. Same old Sunday plan! If I can remember to grab the camera before everyone digs in, I’ll post a shot of one of my platters on Instagram. I hope this meal plan is helpful to you this week. What looks good to you or what would you add? Are there specific types of recipes you would like me to share? Please pin my meal plan to Pinterest for your reference and tag @restandrelish on Instagram and Facebook if you make any of my recipes! I would love to see your renditions and hear from you! Have a great week!